Glad to be back in one of our favourite cities – Seoul – and this time we’re staying at the luxury Lotte Hotel Seoul in Jung-gu, literally next to primary shopping district Myeong-dong. Lotte Hotel Seoul is the very first hotel opened in 1979 by luxury hotel chain Lotte Hotel and Resorts that operates 19 Luxury hotels predominately across Asia, and part of the conglomerate Lotte Group. The KAL Limousine Bus stops at Lotte Seoul from both Gimpo and Incheon International Airports, or you can arrange airport transfer with the hotel on their very comfortable Equus limousines for 140,000 won (AU$160) on a roughly 70 minutes journey. As one of Korea’s best 5 star luxury hotel, it offers 1,120 rooms across two buildings, Main Building and New Wing. The Main Building houses about two-thirds of all guest rooms and is targeted to conference and leisure whilst the New Wing is mainly for business travellers. Don’t be deceived by the name though because you’ll want to stay in the Main Building because all rooms were completely renovated in 2009 by top design firms SOM, Wilson & Associates and HBA to offer guests three different styles of rooms. We stayed in a spacious (40~46 m2) Club Deluxe Room high on the 30th floor and if I’m not mistaken, this was designed by HBA. The room is light-filled and offers a bird’s eye view of downtown Seoul. As you’d expect from a top hotel, the bed was most comfortable and comes with an extensive pillow menu. There’s heaps of space for storage and everything is electronically controlled, including the toilet. When you’re paying for luxury, you expect luxury all around and that includes toiletries. More and more hotels are working with renowned brands to provide guests a seamless luxury experience, Waldorf Astoria offers Salvatore Ferragamo, Ritz Carlton offers Asprey, and Lotte offers Molton Brown. Other great features include a local mobile phone to take out which connects to the hotel’s front desk from anywhere, handy when you need a translator. Incoming calls are free but outbound call charges apply. Then of course there’s free WiFi, which is commonly available throughout Seoul. Club floor guests have access to the largest exclusive business lounge in Korea, Club Lounge on the 31st floor. 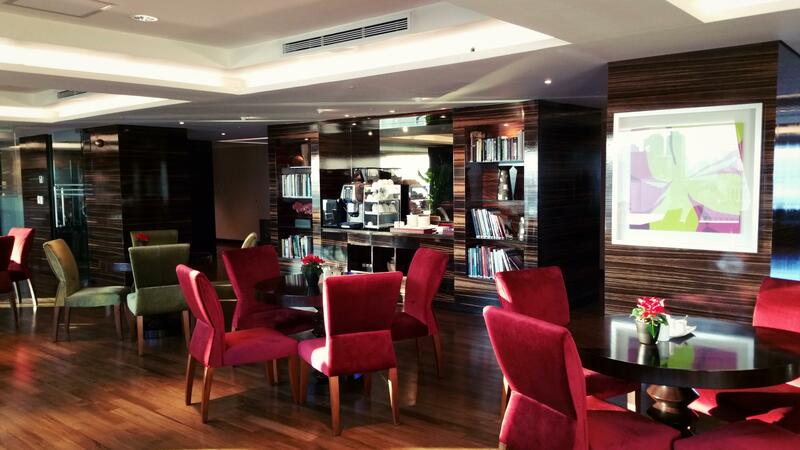 With its own dedicated check-in for Club guests, the lounge also offers buffet breakfast, light snack, afternoon tea and cocktail hour which is a great place to rest and have a sip of coffee or a glass of wine. Admittedly like most club lounges, the breakfast selection is limited compared to the main hotel restaurant and it would’ve been better if they offered something a little different every day. Club guests also receive free DVD rental, use of executive meeting rooms and work stations, discount at hotel restaurants and free entry to the Fitness Club. (There’s a separate Club lounge in the New Wing). The large gym located on level 3 will satisfy any gym junkies while the pool’s minimalist design oozes a sense of serenity and the sauna with two hot and one cold round bath pools together with dry and wet sauna/steam rooms is the ideal place for relaxation. However, for the ultimate treat, head to the Sulwhasoo SPA for a therapeutic treatment using its famous precious herbal medicinal ingredients that replenishes fatigued skin and harmonises your body and mind. If that’s not enough, there’s a golf range spanning an area of over 800 square metres. There is certainly no shortage of shopping opportunities at Lotte Hotel Seoul as the hotel is linked to the Lotte Department Store which offers 12 levels of shopping, including three levels of Duty Free Shops (which gets extremely, and I mean extremely crowded) and another two levels of restaurants. Then from Lotte Department Store, you’re linked up to AVENUEL and Lotte Young Plaza, another two multi-story department stores. Prefer shopping in the open? Myeong-dong is literally across the road, here you’ll find plenty of international/local fashion, F&B and cosmetic retailers. Coffee and cosmetics is huge in Korea so never use these as your landmark because chances are there are 4 or 5 of the same shop (brand) in the area. Myeong-dong is always crowded, but particularly so at night with the night market. Try to go on an empty stomach as your eyes will be tempted by stalls after stalls of local snacks from grilled octopus, butter corn to the must have chocolate strawberry mochi! 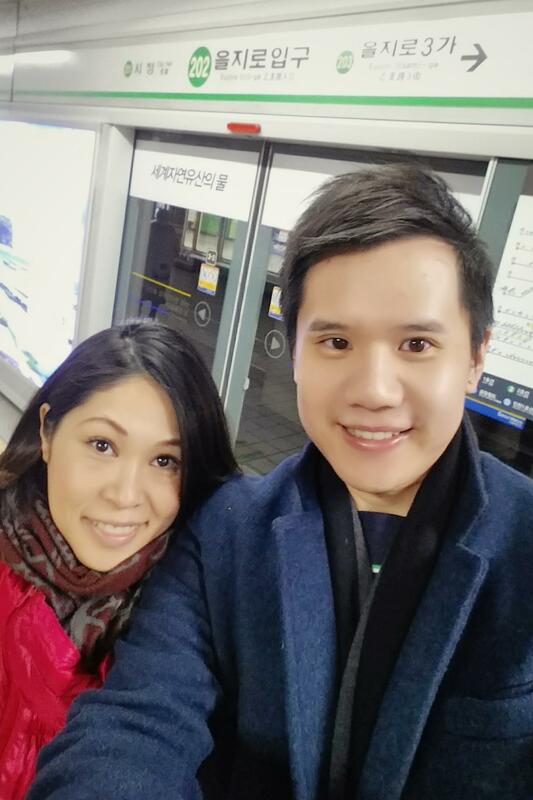 Venturing out is really easy as the Euljiro 1-ga (Line 2) subway station is pretty much linked to the hotel and the subway system in Seoul is cheap, convenient and easy to navigate. Otherwise, taxis are readily available and very economical compared to Sydney, but language may be a barrier so ask the hotel to write down where you want to go in Korean, or catch an International Taxi. The hotel also provides a complimentary shuttle service to sister Lotte Hotel World with stops at expat/clubbing central Itaewon (advance booking required). Overall, Lotte Hotel Seoul is a perfect blend of true all-round 5-star luxury and absolute convenience. Compared to other hotels we’ve stayed in Seoul, including the Conrad Seoul at Yeouido (read my review here), JW Marriott Seoul, Courtyard Marriott at Times Square, Fraser Suites at Insadong, and Grand Hyatt Incheon, Lotte Seoul is by far the best hotel yet. Not to say the others weren’t good, each hotel had its positives, but comparatively Lotte Hotel Seoul was the best all-rounder and we’d be more than happy to stay again.